The first week spent at Kawempe Hospital would be better referred to as orientation week. We were welcomed and had a short tour of the 9-level hospital, Mulago National Hospital ‘s directorate for Obstetrics and Gynecology for the mean time since the main hospital is under renovation. I have been placed to work on level 6, a level housing the Highly Dependant Unit, Oncology section, General Gyn, and Urogyn units. 2 Intern pharmacists placed on level 5 where the volume of patients seen is highest. Level 1 in which there is the OPD unit, level 4 housing the delivery suite and level 7 dedicated for patients who pay for all the services out of pocket all have one intern pharmacist in charge of the pharmacy unit. As is the norm, the tools of work such as the stock cards, dispensing log books, stock that remained after the previous interns left were handed to us and we were officially handed the mantle to start our 1-year long internship program. Week 1 was also an opportunity to get to know our colleagues better.3 of my colleagues pursued their pharmacy education from Algeria and one from India while the 3 of us all studied locally in the same university. I came to learn some interesting facts about pharmacy education in Algeria. Apparently, Algeria offers both Doctor of Pharmacy programmes which is a 7 year program and bachelors of science in Pharmacy programme which runs for 5 years. Regardless of which path an individual chooses to take, he/she ought to learn French, the language in which the courses are taught, in the first year exclusively rendering the first year basically for learning French. No doubts my ability to speak French could not match their fine mastery of the language. One of them offered the PharmD programme while the latter offered the BPharm programme and so I was curious to know what was unique about the 2 courses. What stood out in my interaction with these folks was the extent to which they had studied modules related to medical laboratory work as they detailed their knowledge in parasitology, microbiology, clinical chemistry and other related course units. Had they pursued these related course units in Uganda, they would pass off more as Medical Lab scientists than Pharmacists. 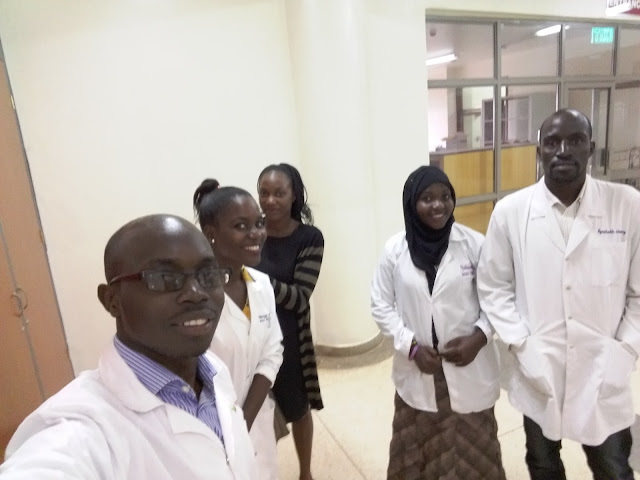 It was more surprising to learn that pharmacists in Algeria were allowed to open medical laboratories to perform some of the laboratories to carry out the medical investigations synonymous to what medical laboratory scientists do here in Uganda. 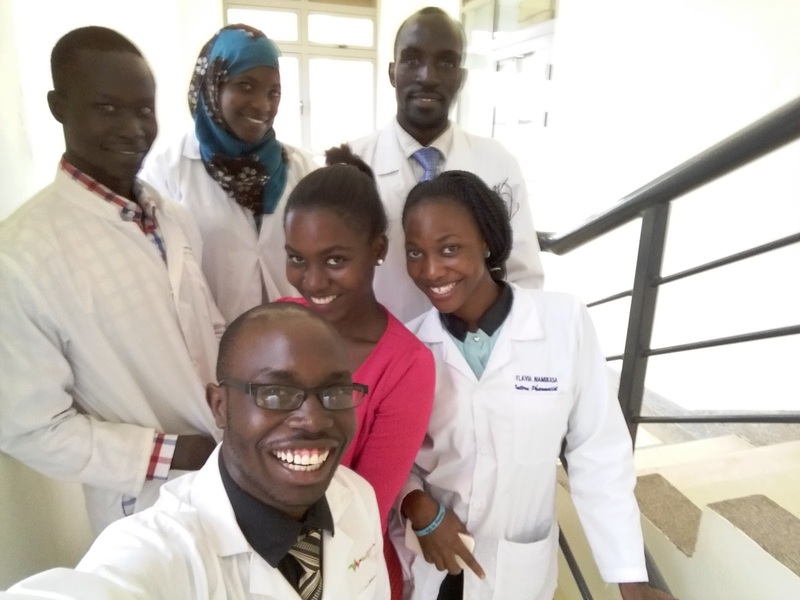 Group Photo of the Intern Pharmacists; Back Row from Left;m Komakech Walter, Nabuuma Mariam, Kyambadde John .M. Unlike our foreign trained colleagues, our learning leaned towards more hospital based pharmacy roles such as provision of pharmaceutical care, pharmaceutical analysis in industry and developing a better understanding of use of natural products or herbal products in the management of diseases. Like Algeria, India also runs a dual pharmacy program in which both the PharmD and BPharm curriculum are run. With all this diversity in education, we can only hope for a richer interaction sharing experiences and getting a better sense of how either parties can benefit from these varied learnings.